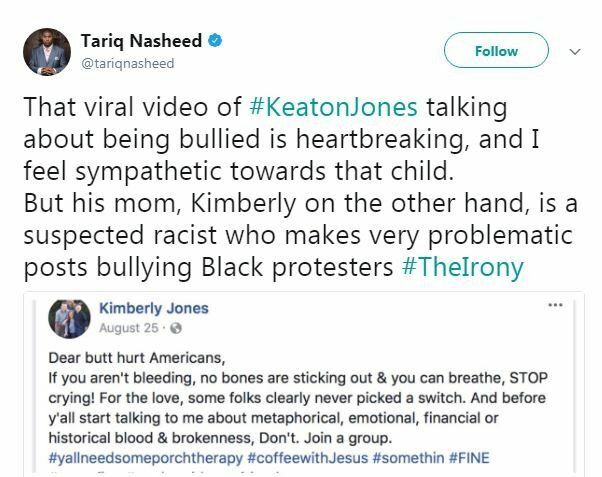 A video of 11-year-old Keaton Jones, crying and begging his bullies to leave him alone, quickly went viral after his mother Kimberly posted it to Facebook on Monday. In it, Keaton, of Knoxville, Tennessee, describes how bullies called him ugly, made fun of his nose, told him he had no friends and poured milk on him. The video has more than 22 million views, and even celebrities such as Chris Evans, Justin Bieber, Demi Lovato, Millie Bobby Brown and Rihanna reached out to show their support. He was even invited to attend the Avengers premiere in LA next year by Chris Evans. However, Keaton’s family are now facing a backlash, having been accused of asking for money as well as having racist views. The criticism came after a photo emerged, showing Keaton and his family with the Confederate flag. The flag is controversial as it was first introduced in the US Civil War to keep slavery legal. It is seen as a symbol of racial hatred. When talking to ABC News, Kimberly claimed the photo of the flag was meant to be “ironic, funny, extreme”. “I am genuinely, truly sorry. If I could take it back I would.” she commented. People have also questioned why Keaton has a GoFundMe page, as well as how donating to them would stop the problem. Allegedly, Kimberly started to ask for donations through her Instagram account (KimberlyJones_38). 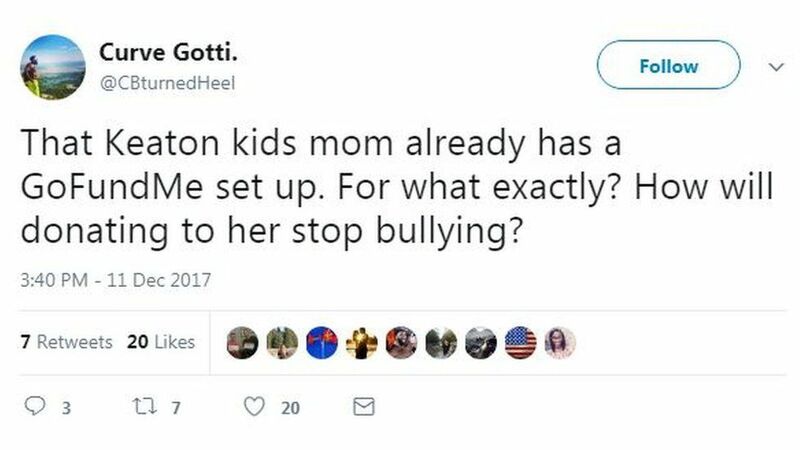 However, her daughter Lakyn insists that the account is fake and not ran by her mother. The GoFundMe page was created by Joseph Lam, and while he acknowledged that money won’t solve the issue of bullying, he said financial support could help Keaton further his education. Not only has the criticism been aimed towards the family, but also Keaton himself as some had been saying that he was making racist remarks towards fellow students. Lakyn denied this too, and said her brother doesn’t use the “N” word. With so much going on with this story, it’s hard to know whether these allegations are true or not. Regardless, since this huge backlash, the original video has been taken down from Facebook and his GoFundMe page has been put on hold. Is it really a genuine bullying story, a big misunderstanding, or just a ruse to gain money? Who knows? Sometimes these viral stories happen so fast, it’s hard to get the facts all at once. However, it does seem like he has been bullied, and unfortunately, the Confederate flag is part of the South’s history, which doesn’t always make it racist, even though it’s a flag that’s very much frowned upon due to its history. The Confederate flag has deep historical associations with the Democratic party, so if it’s racist, then no look no further than the Democrat party as well.